Edmond's series of topographical drawings date from 1714 to 1730, largely, however, one of the front of Prideaux Place shows the Temple and the Obelisk which were erected in 1739. His drawings give a delightful view of English through the eyes of a perceptive and talented amateur artist. Of the 33 houses visited and portrayed, 22 of them were Prideaux related, or connected through friendships & business. Edmond travelled to visit family and friends. to make a record of the country house in this manner. Coupled with the evidence in his Cash Book, etc., as well as the dates on some of the drawings, it is relatively easy to say where Edmond was in any part of his years. 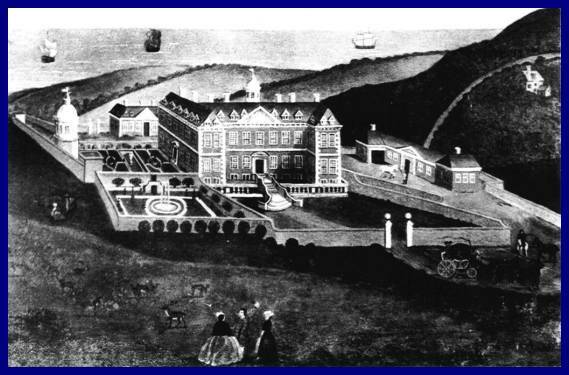 The drawings of Prideaux Place differ from other views ( some classical landscapes, some well defined and detailed presentations ) in that many are very graphic, almost for a purpose, as if working on the idea of alterations, rather than record, but they do indeed form a record. It had long been held that the East front was altered in the 1730's. After close examination of the drawings and the paintings, it is revealed that those alterations were performed by Humphrey, Edmond's son in the 1750's whilst the battlemented gate and walls, as exist today, were being formed. It is also clear that Prideaux Place had a larger Gatehouse on the East, rather than the present smaller gateway. These drawings, together with other physical evidence and records have allowed me to compile the development of the house and garden plans over the years. Edmond’s knowledge of depth, shadow and perspective developed from his earlier oblique projections and single point perspectives fully fledged presentations as those at Blickling.